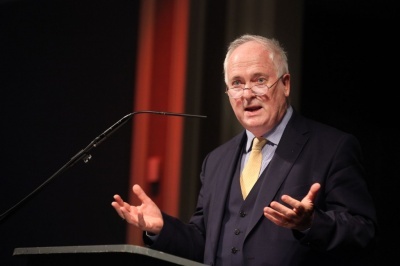 Addressing a gathering of over 800 people at the annual Pro Life Campaign dinner in Dublin on Saturday evening, Mr Bruton singled out Minister Simon Harris over recent remarks he made. Mr Bruton said: “The Minister for Health, speaking in the Dáil after the referendum, on 31 May, did not seem to me to display the balance, and attentiveness to other points of view, that one would like to see in someone who will be deciding on the detailed content of the Termination of Pregnancy Bill. “He spoke of the referendum result inaugurating what he called ‘a brighter Ireland’. It will not be a bright Ireland for the little babies who will have their lives ended before being allowed to see the light of a single Irish day. The former Taoiseach continued: “He talked of the referendum result ‘consigning a misogynistic legacy to the history books’. He did not seem to reflect on the fact that half the babies whose lives will be ended before birth will be girls. Those little girls will face the most extreme form of misogyny. Mr Bruton said he fears “that doctors who are known to oppose abortion will be targeted under this clause by people wishing to catch them out and put them under threat of criminal prosecution because of their religious or human rights beliefs. There have been examples of this sort of targeting in other fields, where there are strong but conflicting views in the population. He said: “It is unclear what the new shared values of Irish society are to be. The referendum did not end the debate. If life is not the primary value, what is? To fill that vacant space, and drawing on the most modern medical knowledge, the pro-life arguments will need to be made, over and over again, to the young people of Ireland and to the generations that will succeed them.